By far the most commonly asked for cartilage piercings that I have been asked about over the last year are the triple forward helix piercings. There are many misconceptions about these piercings. While I don’t wish to speak ill of anyone, the reason for this is bad information passed along to folks by piercers who have not performed the piercings or have performed them incorrectly. That being said, let’s straighten these issues out so you can receive great triple forward helix piercings! First, they are not dermal anchors or surface piercings. They are standard cartilage piercings. if someone tells you differently, run away and don’t let them touch you! While this particular configuration of piercings has recently become very popular, it isn’t “brand new” or overly advanced. If a piercer can’t figure out what is going on with the triple forward helix, it probably says something about their experience and/or understanding of basic body piercing. 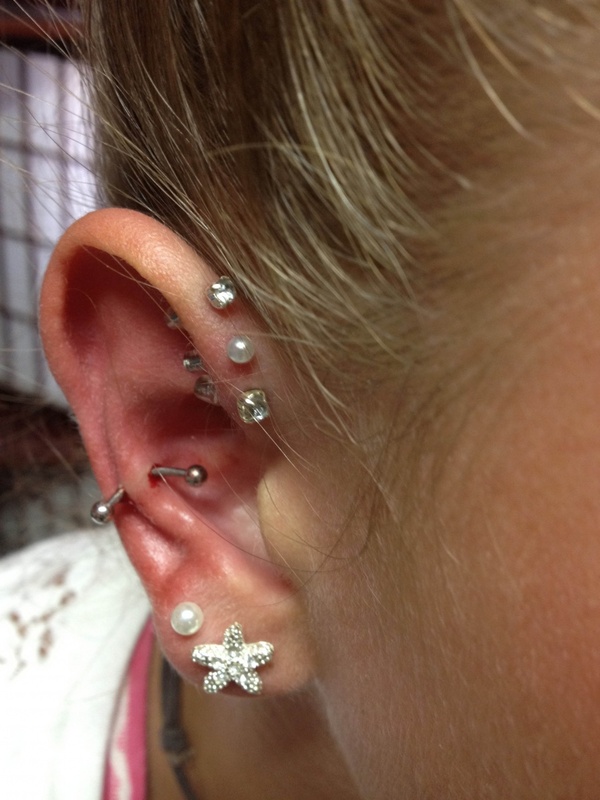 Second, I recommend that with these and virtually all piercings that rings NOT be used for initial healing. Rings will tend to move much more than studs do and they will also tend to get bumped/snagged much more often. This combination makes the piercings much harder to heal with rings and greatly increases the likelihood of healing problems and excess scar tissue formation. Lastly, as with all piercings, insure that your piercer is using quality jewelry. Here at my body piercing and jewelry studio in Arlington, Va, I use ONLY implant grade materials for all body piercings. If i have had trouble with cartilage piercings staying sore and not being able to keep the piercing in before is it likely that i will have problems the triple forward helix? There are many factors which determine the health and ease of healing with any piercing. I would need to further discuss with the you the circumstances surrounding your other piercings to give you an accurate assessment. If you are local to Arlington, Virginia, please feel free to stop in. Otherwise, you can shoot me an e-mail. It’s not about the thickness, it’s the surface area available to pierce. Like they said, you would have to stop in so I could take a look.